This past year, Bon’App’s Campus Ambassadors set out to begin CFI (Campus Food Investigation). In doing so, the ambassadors distributed a survey, which asked students to rate their campus’s dining hall food on a 1-5 scale. In addition, students told us what options they had on campus, and expressed what they loved and hated about it. Here at Bon’App, we got to hear from a total of 457 students from 27 colleges across the country. These 27 colleges included, Babson, Berkeley, Berry College, Boston College, Brown, Bryn Mawr, Cal Poly, Gonzaga, Harvard, HULT, James Madison, Miami Oxford, North Carolina State, Northwestern, NYU, Pomona, Simmons, Stanford, Swarthmore, Tufts, Tulane, U of Florida, University of Alabama, UPenn, USF, Virginia Tech, and Wesleyan. 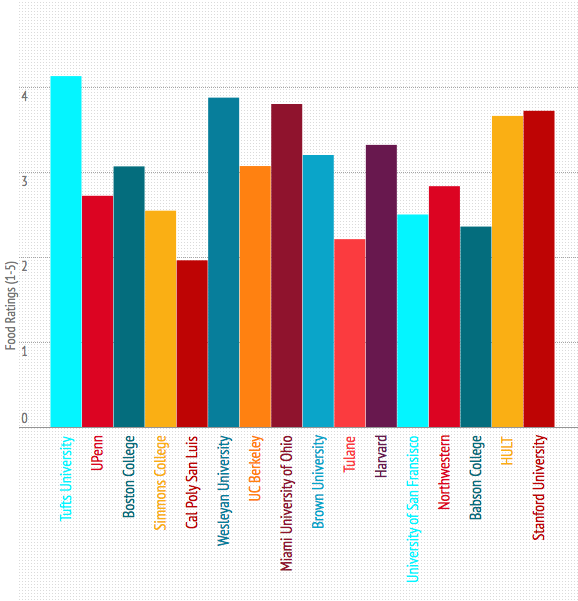 Based on the averages of student ratings, the chart below illustrates how each college stacked up against each other (excluding those with too few responses). Only colleges with greater than 3 responses are displayed. Show us what your dining hall has to offer you, whether good, bad, or ugly. Get our attention by using #campusfoodbonapp on Instagram and interacting with us via our CFI Facebook page. For more information check out our earlier blog that illustrates Bon’App’s Dream Dining Hall.